Al Shabaab militia fighters take part in a drill on the outskirts of Mogadishu, Somalia. The United States has been involved in Somalia since the early 1980s, first during the Cold War and then in 1992 during the country's massive famine by launching the humanitarian mission Operation Restore Hope. In the last decade, however, the United States has become even more involved, actively supporting the Transitional Federal Government (TFG) as a means of building peace in Somalia, which is now experiencing rising violence associated with the extremist groups Al Shabaab and Hizbul Islam. Yet as the country experiences rising violence, the semi-autonomous regions of Puntland in northeastern Somalia and Somaliland in the Horn of Africa have been able to provide a greater level of security for their residents than the rest of the country and may provide the key to greater stability across Somalia. Recognizing the value of strengthening and supporting these regions, Johnnie Carson, assistant secretary of state for the Bureau of African Affairs, announced this week that the U.S. government will support Puntland and Somaliland with development aid and strengthen them within a framework of two-track engagement as part of a larger approach to ensure stability in Somalia as a whole. This decision reflects what many Somalis have stated they believe will be effective in stabilizing their country for the long term. Carson says that "the first track is designed to help the TFG become more effective and more inclusive and to give it the ability to provide services to its people." Engagement with the Puntland and Somaliland regions is part of the second track, he added. The aim of this engagement is to stabilize Somalia and undermine extremists by empowering local officials to provide security and ensuring that young people have jobs, making them less vulnerable to Al Shabaab and groups like them. Carson also stated that the U.S. government will continue to support the TFG and the current Somali president as well as other regions and clans interested in protecting their areas from extremists, which the TFG has welcomed in light of the threat from Al Shabaab. Caron's announcement comes at a crucial time for Somalia as the group is consolidating its control in most of southern Somalia. 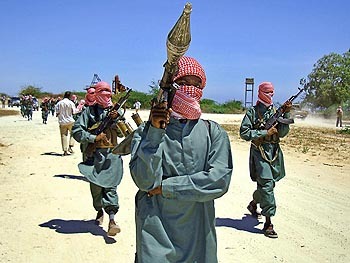 Suicide bombings and terrorist acts by Al Shabaab are becoming more brutal. The violence threatens not only Somaliland and Puntland, but also Kenya, Ethiopia, Uganda and Yemen. Earlier this year Al Shabaab carried out suicide bombings in Uganda, for example, killing more than 70 World Cup spectators. This two-track engagement acknowledges the hard work in peace building that Somaliland and Puntland have taken on, and demonstrates a concrete grasp of what Somalis want: employment for youth, development aid, infrastructure that facilitates the delivery of services and a strong state police to keep the peace. In the past, the United States focused on providing humanitarian aid and supporting counterterrorism efforts. This policy change allows the United States to not only focus on these short-term goals but also to provide a foundation for long-lasting change through agricultural development, infrastructure, economic development and security. These two regions already have their own parliaments, presidents and police, but they are weak and need this type of development support from the United States, the European Union and the Arab League. The success of indigenous peace building in Somaliland and Puntland is an example that the rest of Somalia can follow. Strengthening their institutions will fend off the extremist threat emanating from South Central Somalia. It will be important for the United States and the European Union to support other regions that are interested in building their own administrations. This will help these regions to jump start employment opportunities and development and to build their security force to defend against a potential extremist takeover. Supporting those peaceful regions does not mean having to recognize them as countries, and the U.S. government made it very clear that such engagement does not constitute recognition for Puntland and Somaliland as states. The United States has finally gotten it right by listening to what the Somali people want. It's time the United States comes forward with concrete support in the form of economic development, infrastructure and security to alleviate the suffering of the people, understand the nature of terrorism in Somalia, and ensure that a democratic system of governance—and peace—takes root in Somalia. Hussein Yusuf is a doctoral student in conflict resolution at the Institute for Conflict Analysis and Resolution at George Mason University. This article was written for the Common Ground News Service: www.commongroundnews.org.